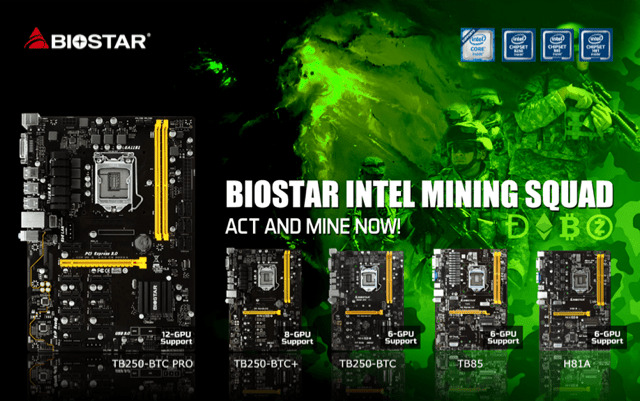 September 13th, 2018, Taipei, Taiwan – BIOSTAR, a leader in crypto mining motherboards, introduces two new BTC series professional crypto mining motherboards – TB360-BTC Expert and TB360-BTC PRO. Fully optimized for professional crypto mining, the TB360-BTC Expert and TB360-BTC PRO support 17 x PCI-E 3.0 and 12 x PCI-E 3.0 expansion slots respectively. Packed with features for scaling up professional mining operations of any size, the TB360-BTC Expert and TB360-BTC PRO ensure a rock-solid mining system with improved mining performance. The BIOSTAR TB360-BTC series is also the first crypto mining motherboards based on the B360 and H370 chipset, which can support 8th generation Intel Core processors. Aug 16, 2018, Taipei, Taiwan – BIOSTAR introduces the H310HMC2 and H310HMD PRO2 entry-level motherboards with a new BOS for improved performance in gaming and VR with Windows 7 compatibility. Powered by the Intel H310 chipset, the motherboards offer gamers a well-balanced set of premium features typically found in higher-end motherboards such as a high-speed 10Gb/s M.2 support (H310HMD PRO2 only), ultra-fast USB 3.1 Gen1 ports, immersive 7.1 high-definition audio and HDMI connectivity at an affordable price range. Taipei, Taiwan – BIOSTAR iMiner A578X8D, an easy to set up all-in-one solution for home and professional miners, is now available on Newegg for US$3499. The BIOSTAR iMiner A578X8D is the world’s first riser card-free and all-in-one crypto mining solution, offering ultra-mining flexibility for different crypto-currencies (Ethereum, Monero, Bitcoin Gold, Zcash, etc.). This plug-and-mine system requires no additional hardware installation, simply power-on to start mining. The BIOSTAR iMiner A578X8D supports Windows 10, Linux and ethOS for different types of miners, and as an exclusive bundle with Newegg, the iMiner A578X8D also comes with an optional ethOS mining operating system to allow users to set up and start mining immediately. Aug 18, 2017, Taipei, Taiwan – BIOSTAR proudly announces an exclusive partnership with ethOS, a 64-bit Linux OS; giving miners the simplest possible way to set up a mining rig. This comes as great news for anyone who wanted to dabble with mining but was not sure how. With the ethOS mining OS, there is no need to install drivers, configure Windows or compile software, while BIOSTAR crypto mining motherboards are tried and tested with the ethOS mining OS, making it as simple as boot and mine. Get ready to collect your Ethereum, Zcash, Monero and many other GPU-minable coins.